The story behind my getting this book is that I first bought it new in Woolworths in 1968, but at that time, I was mainly reading Doc Savage and short stories, and must have found it too mature to get further than the first chapter. In recent years I finally gave it away... then decided I’d made a mistake. Finally I found it again in a Camborne shop and was startled to see it was by Braddon, author of Year of the Angry Rabbit (which many will know was filmed as Night of the Lepus - intended as a satire, this novel became a B-movie about gigantic giant killer rabbits!) 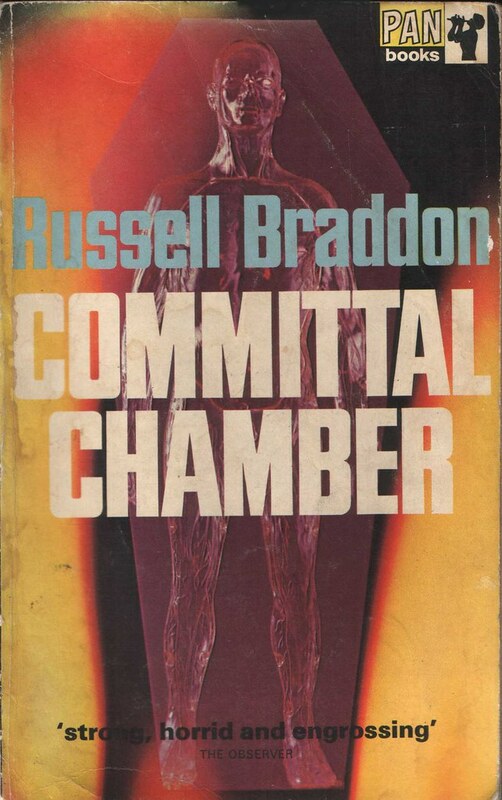 I still had no idea what an engrossing book Commital Chamber was, but now have no hesitation in recommending it. 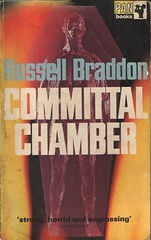 The committal chamber is the room where coffins arrive, after they disappear through the black curtains in the crematorium, after the funeral service. The black drapes are a deliberate piece of theatre, intended to conceal the reality of the chamber from the mourners, who believe that the late lamented’s body is now immediately being consumed in the flames of a fiery furnace. In fact, the coffin arrives at the chamber and is deposited on a trolley, where the lid is loosened (or the coffin will explode). And there it might rest for some hours, possibly providing a makeshift bench for Tony, Edwin or Ivor to sit astride, while enjoying their tea break. It’s a pretty good job, tranquil, and not too strenuous, and young Tony and his two older companions get along pretty well together. Until the day that the shower is installed. The shower is Ivor’s idea. It gets pretty hot in the chamber from the furnaces, and it’s sweaty and dusty work. But when Ivor appears naked for the first time, the others are startled. Under his shapeless overalls, his body seems untouched by the years, youthful and vigorous. The effect on young Tony is traumatic. Until now, he’s liked Ivor, but suddenly he seems possessed by envy and hatred. The effect on Edwin, who was Ivor’s C.O. in the war, is almost equally startling. These lives of the three men and of the older mens’ wives, are all subtly or dramatically affected. It is very clear that from the moment of Ivor’s naked and completely uninhibited emergence from the shower, they will never work peacefully together again. Aware of Tony’s hostility, Ivor at first tries to ease the tension, then becomes more threatening. Edwin knows that Ivor can be dangerous if pushed. In the War he’d singlehandedly taken out an enemy machine gun post, killing all eleven soldiers manning it with grenade, gun and bayonet. Then Ivor points out to Tony that if anyone wanted to commit a murder, then the committal chamber would make it very easy. The usual problem with a murder is getting rid of a body afterwards. Here, that problem didn’t exist. In fact, why even bother murdering someone? Why not just drug them and put them in a coffin? In the morning, there’d be a few more ashes to put into the urns, and who’d know the difference. After a while, it becomes less and less certain who’s going to kill whom. But when we get to the crime, it is absolutely horrible and the tension almost unbearable. If you’d ever wondered what one of those sadistic Pan stories would be like at novel length, this book provides an answer. And then when it’s all over, the tension starts cranking up again! Gripping stuff. If I read another book half as good as this one this year, I’ll count it a very, very good year.